Now it does appear that Fox and Denver GM John Elway had their fair share of issues, similarly to how out in how 49ers coach Jim Harbaugh and GM Trent Baalke battled internally (albeit without being as known publicly as the issues out in Santa Clara). And Elway made it clear today that the expectations are for the franchise to win championships and in fact it appears that unless the team won the Lombardi Trophy, Fox was going to find himself out of a job. But I do not think that Fox is the reason as to why the Broncos came up short this year but instead, I would blame the diminished performance of Peyton Manning as he struggled down the stretch in December and was largely ineffective against his old team on Sunday. Whether or not he was injured, it certainly was not the same Manning we saw from last year and even earlier this season. The Colts were daring him to beat them down the field and he could not do it. Hence why the retirement rumors are not going away. Fox is a pretty good coach and his record speaks for himself. 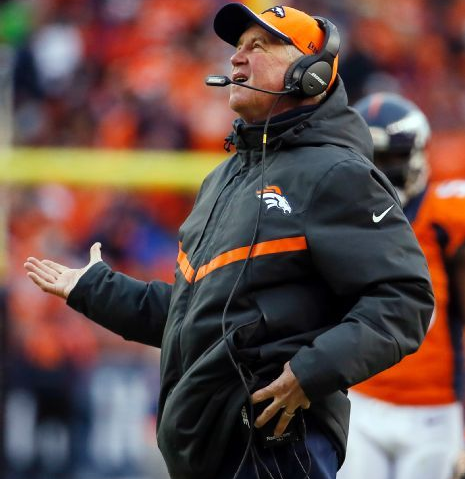 Sure his clock management decisions are far from the best but he has always been a really good defensive coach, he did a great job in Carolina and again, he won a division championship every year in Denver including with American hero Tim Tebow. The issue that I often have with firings in situations such as these, when the team has won but not enough to meet the expectations, is that you have to have somebody better in mind as a replacement. Looking at a list of potential successors to Fox, you cannot say that there definitively is a better option. Gary Kubiak goes way back with Elway and the franchise and he is a very good offensive coach but his reputation during his prior head coaching gig in Houston was that he did not do enough to meet expectations (sound familiar). The list of potential assistants on the list (Ravens QB coach Rick Dennison, Lions defensive coordinator Teryl Austin and Seattle defensive coordinator Dan Quinn) are all highly regarded but without any head coaching experience, it comes with some risk. And by promoting from within as offensive coordinator Adam Gase and defensive coordinator Jack Del Rio (who does have head coaching experience with over eight years with the Jaguars) are both in the mix but aren't they also part of the mix that failed to meet expectations? There is no denying that Fox and Elway had their issues but ultimately this decision is all about not winning the Super Bowl. So now Elway has put the franchise in a place to where this new coach has to win the Super Bowl now or else the move looks ridiculous. Elway has done a pretty good job running the show with the Broncos but I think this is a needless risk in parting with a good coach.